Another ways how Salvador people dress like. Mostly all Salvador people wear this type of Dresses for an important Day such as a birthday party or independence day or christmas or others important event that can happen in El Salvador. This is another way how salvador people dress like during A important event. Many people from salvador wear this kind of dress when they dance for example when its independence day lady's wear it. Even though this dress doesn't have the salvador color this is still a salvador dress. Some people such as men's wear T-Shirts to go to school or to party or just to go out with their friends. 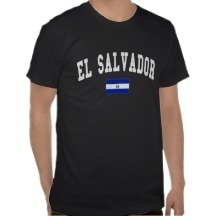 This is a salvador shirt because it has the name of El Salvador and it has the flag of El Salvador too. You don't have to wear something fancy to or traditional to represent that your from El Salvador. You can wear anything normal.